The Royal Melbourne Institute of Technology is one of Australia’s original and leading educational institutions, producing some of Australia’s most employable graduates. As an innovative, global university of technology, with its heart in the city of Melbourne, RMIT has an international reputation for excellence in work-relevant education and high quality research, and engagement with the needs of industry and community. With more than 60,000 students studying at RMIT campuses in Melbourne and regional Victoria, in Vietnam, online, by distance education, and at partner institutions throughout the world, the University is one of the largest in the country. It has built a worldwide reputation for excellence in professional and vocational education and research. A vibrant alumni community now stretches across more than 100 countries. In 1881, prominent grazier and philanthropist, The Hon. Francis Ormond, proposed that a technical college would serve "useful" to City of Melbourne. Ormond - who had donated the majority of funds towards the foundation of Ormond College at the University of Melbourne - offered £5,000 towards the establishment of a college on the proviso that the public contribute a "like sum". A considerable sum was raised by the Council of the Melbourne Trades Hall, which rallied support amongst its membership of unions. 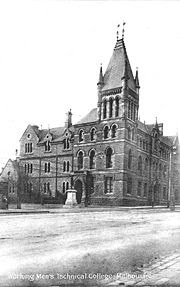 Construction of "The Working Men's College" then began in 1886, on a site provided by the Colony of Victoria, next to the Melbourne Magistrates' Court, and adjacent the Melbourne Public Library on La Trobe Street. The College was officially opened during a gala ceremony on June 4, 1887 and, on the night of its opening, took 320 enrollments which increased to over 1000 within its first 12 months of operation. Ormond - who was a staunch believer in the values of education and a tireless campaigner for the College - served as its President till his death in 1889. The College began offering full-time courses in 1899, and was incorporated under the "Companies Act" as a private college in 1904. Around the turn of the century, it began developing courses in engineering, applied science, chemistry, metallurgy and mining. Between the 1900s and the 1920s, the College expanded beyond its foundation building, and constructed two new buildings on nearby Bowen Street, a new Art School and also acquired the neighbouring, and recently decommissioned, Melbourne Gaol site for expansion. In 2007, RMIT University proudly celebrated 120 years since we opened our doors on 7 June, 1887, as the Working Men’s College. RMIT University is today one of Australia’s leading educational institutions, with a commitment to applied education, training and research. From an encouraging intake of 600 students, RMIT University has grown to a global university of more than 63,000 students, including 21,000 international students drawn from more than 100 countries - an institution recognised internationally for the quality of its graduates and the excellence of its research. hey nice blog..care ta exchange links?